Oh damn it. This product is sold out. call or email and we can let you know your ETA. Charlie says... "Awesome but of kit: a crazed place where design meets beer, meets art, meets fun. If you read "zen and The Art Of Motorcycle Maintenance you will recognise this product as classical perfection. This was orginally cast from a clay model, hand crafted by a chap at surly. So much more than a tool"
Our Jethro Tule pocket tool combines an offset box wrench on one end with a bottle opener on the other. 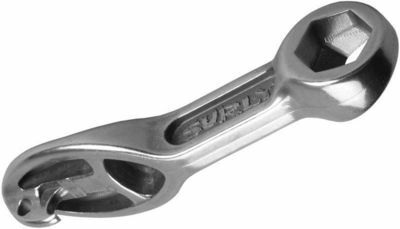 The double-sided 15mm box wrench works with most nutted hubs on the market, and it fits nicely inside recessed dropouts, including those found many of our frames (the 1x1, Steamroller, Karate Monkey, and Pugsley). The smooth, spoon-shaped handle provides ergonomic pleasure for your palm under the most rigorous wheel-removing operations, and it opens a cool refreshing bottle of whatchoogot after the ride. The Jethro Tule is “Thick as a Brick”, crafted from stainless steel and then polished. It works like it’s supposed to and feels good in your pocket. It's a frequently hectic little shop with a sofa and fresh coffee. Its also only a stones throw from the beach, and a few miles from The Square & Compass (the best pub in the world) and 50m from The Black Swan which is great for food - check out the partridge and chestnut casserole. Just about everything in our webshop is available at our High Street shop - the main exception being some frames and complete bikes. You are also welcome to pick up any online purchases direct from the shop. © Copyright 2014-2016 Bikemonger Ltd All rights reserved.